It’s springtime and I’ll be out doing some planting today. Yesterday, at the farmers market, I picked up four seedlings: Pepper, Heirloom Tomato, Thai Basil, and Mexican Squash. Can be planted earlier in the season because the soil is warmer when it is above ground level. 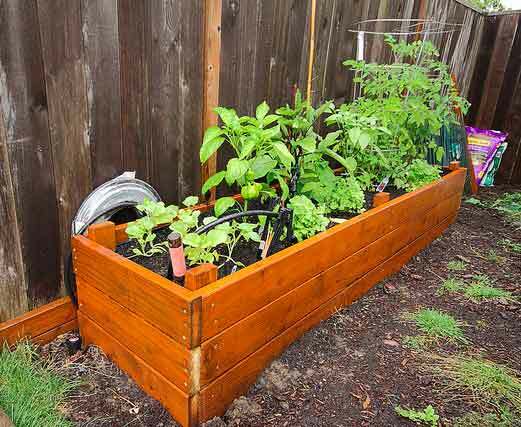 Raised bed gardening is a form of gardening in which the soil is formed in 3 – 4 foot wide beds, which can be of any length or shape. The soil is raised above the surrounding soil (approximately 6 inches to waist-high), is sometimes enclosed by a frame generally made of wood, rock, or concrete blocks, and may be enriched with compost. The vegetable plants are spaced in geometric patterns, much closer together than conventional row gardening. The spacing is such that when the vegetables are fully grown, their leaves just barely touch each other, creating a microclimate in which weed growth is suppressed and moisture is conserved. Additionally, waist-high raised beds enable the elderly and handicapped to grow vegetables without having to bend-over to tend them.